Hoping to boost the morale of teachers weary of repeated school evacuations because of growing terrorist threats, Burkina Faso’s ministers of homeland security and education took a tour last November 2017 of areas in the north that had been recent targets. They were met with an all too concrete reminder of the persistent rise in Islamic extremism in their region when during their visit an armed attack in the northeastern Sahel region killed six people. The sparsely populated region is particularly vulnerable to terrorist activity, as perpetrators can disappear easily into vast deserted areas. Burkina Faso has been living under the threat of a rising number of terrorist attacks since 2015. The northern region has been widely excluded from economic and social development, and poverty remains a significant challenge. A failure to address poverty and inequality, and their roots in lack of education, may result in an increase in ideological and religious fundamentalism, putting the northern region and perhaps the entire nation in a precarious situation. The Burkinabe government is trying to find answers. In response to growing concern for stability, peace, and economic development after a prolonged series of attacks in 2016 and 2017, the Burkinabe government established the “Emergency Program for the Sahel.” The program—based on the National Plan for Economic and Social Development (PNDES)—aims to respond to the political and social challenges that have resulted from fundamentalism and terrorism. With a total budget of approximately $835 million dollars that will be divided between 2017 and 2020, the program is designed to support socio-economic development, public security and defense, and local governance and infrastructure. One focus is on improving communication and interaction between these sectors. The stakes at hand require a frank assessment of whether the program is working. Ministers met in October 2017 with Prime Minister Paul Kaba Thiéba to evaluate the first operations of the program. They reported progress in most focus areas. Yet despite the successes, difficulties have also mounted. As the “Strategic Orientation Council” of the program reported, there was the inaccessibility of construction sites because of growing insecurity, delays due to social movements which carried out demonstrations against the work of the local governors, and the abandonment of various renovation and reconstruction projects due to the closure of companies. To surmount these obstacles, the Strategic Orientation Council of the project recommended the reinforcement of security forces and quick measures to replace failed companies. It also proposed accelerating the implementation of public policies, including closer cooperation with partners to increase financial support for the benefit of water quality, sanitation, and healthcare. The council also advocated to maintain the easing of procurement procedures for the area until 2020, to lower taxes, and to strengthen civilian-military collaboration. Notwithstanding the efforts of the Burkinabe government in creating this program, the reality of life for the population in the north will require a more comprehensive approach. The multidimensional tactics employed by Islamic extremists—military operations, subversion of state authority, intimidation, infiltration civil society and local community councils, and propaganda—also necessitate an approach that incorporates negotiations, diplomacy, and cultural work in the broader sense. That means that a combination of community development, consciousness-raising, and economic development is needed. There are number of measures that could be incorporated into the Burkinabe government’s strategy. Firstly, prioritizing addressing the politics of individual and collective memory in the Sahel zone, including transnational initiatives. This could include the organized remembrance of traditional values and habits, as opposed to radicalization. Recognizing the importance of race, ethnicity, and religion could mitigate the political impacts of radicalization. Creating specialized working groups on trauma and resilience—as proposed by the International Crisis Group—could also reduce the influence of jihadist propaganda. Including a focus on historical knowledge and evidence, and raising consciousness of space, place, and time among citizens are paramount in this regard, along with a greater emphasis on demography policies, including population composition and the problems of urbanization. The use of comparative politics by the government—perhaps by initiating a closer exchange with the Organization for Economic Co-operation and Development (OECD)—will allow best practices to be identified. Finally, a focus on technology for civil society, including schools, linking up with specialized programs in other countries, and improving not only buildings, administration, and infrastructure, but also political culture, for example through civil and human rights education and ethics. This will strengthen social, economic, and political development measures on the whole. In addition to their impact on counterterrorism and development in the north, these measures could also help change the negative perception of the government and its European partners among parts of the Sahel population. This view has strengthened in recent years, particularly after violent clashes in Burkina’s capital Ouagadougou in October 2014 for more participation and democracy where 33 persons were killed and hundreds injured. Subsequent protests and a request by civil society groups for reforms have had limited success in effecting change. 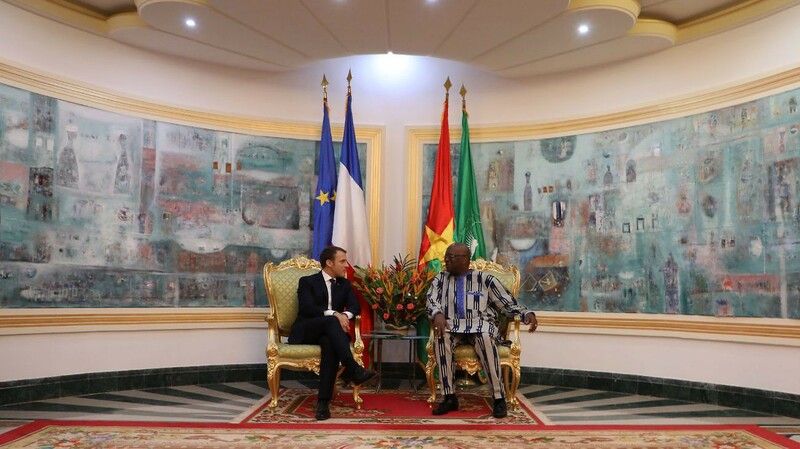 This discontent came in to full view during the recent visit in November 2017 to Burkina Faso by French President Emmanuel Macron. His visit, which came just one and a half weeks after the terror attacks in the north, was met with a grenade thrown at French troops, stones launched at a delegation vehicle, and protests in the capital. The protests confirmed the widespread unhappiness of the population with what is viewed as the inability of French partners to combat Burkinabe government corruption and malpractice. Macron, paradoxically, indirectly confirmed such perceptions by stating that France aims to leave its colonial past behind and will no longer tell Africa what to do. He promised an increase in development aid and offered partnerships in education, renewable energies, startup companies, transportation, and health. Yet many local observers interpreted his words as a retreat from France’s responsibilities towards improving the rule of law and governance in Burkina Faso. During his subsequent visit to French troops in the Sahel region, Macron promised fast and decisive military victories over Islamic extremists, yet the underlying development problems at the roots of fundamentalism remained insufficiently addressed in his outlook. Overall, the challenges to improving the perception of the Sahel zone governments and their alliances will not come easily. The military offensive by the G5 Sahel Joint Force since November 2017—composed of forces from Burkina Faso, Niger, Mali, Mauritania, and Chad in cooperation with France—will hardly solve the problem alone. While ostensibly a successful example of European engagement with support from the United Nations, the alliance between the former French colonies and France remains a “complicated union” that has to be accompanied by democratic and governmental reforms. Otherwise, the commitment by President Macron and German Chancellor Angela Merkel to reorder Europe’s Africa policy will remain empty words in the perception of many West Africans. The outlook for Burkina Faso and the Sahel region in these circumstances is mixed. The Emergency Program for the Sahel has brought progress in different areas. Yet without a more multidimensional effort, the north of Burkina Faso, the rest of the nation, and the greater West African region that has some of the poorest countries in the world, may be entrapped in continuing upheaval and insecurity. This would further destabilize the region and could exacerbate the challenges created by African refugee and migration flows towards North Africa, Europe, and the West. Dr. Roland Benedikter is co-head of the Center for Advanced Studies of Eurac Research Bozen-Bolzano, the research flagship of the Autonomous Province of South Tyrol in Italy, and Research Professor of Multidisciplinary Political Analysis in residence at the Willy Brandt Centre of the University of Wroclaw-Breslau, Poland. His publications on Africa have been published in Foreign Affairs, Global Policy, LSE Africa, and Challenge: The Magazine of Economic Affairs. Ismaila Ouedraogo is a Junior Project Manager and biomedical engineering student at Erciyes University. He is also a Program Coordinator for Plant for the Planet. His publications on Africa have been featured in Foreign Affairs, Global Policy, and LSE Africa.